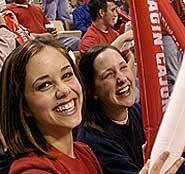 On March 19, the University of Louisiana at Lafayette will host its first Women’s Conference from 8 a.m. to 2 p.m. at the Student Union. The event – “Generations of Women Moving History Forward” – is part of Women’s History Month. Dr. Kim Hunter Reed, executive vice president of the UL System, will serve as the keynote speaker. • Women’s Health by Melissa Fournet with Red Lerille’s Health & Racquet Club and Paulette Landry with UL Lafayette Student Health Services. Luncheon speakers are Dr. Sarah Brabant and Dr. Doris Bentley, UL Lafayette Professors Emeritus and founding members of the Mayor’s Commission on the Needs of Women (now the Lafayette Commission on the Needs of Women). A registration fee of $25 before March 3 or $30 after March 3 includes all conference materials, a continental breakfast and lunch. Student registration is $10. For registration information and program details, go to http://diversity.louisiana.edu. The conference is being sponsored by AT&T.